Greetings Radio Victoria Friends!!!! First of all i would like to say that we have not received any threats or sabotages since January. 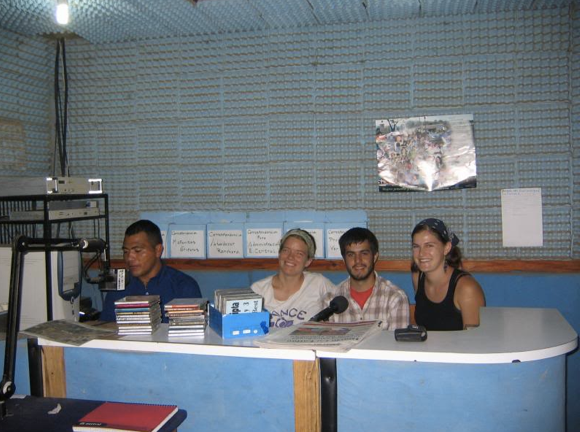 And we have received many visits and expressions of support: - various delegations have come to hear first hand what the Radio has been experiencing and how we have been responding to these difficult situations (Voces on the Border, Sister Cities, the International Solidarity Center, journalists from Spain, Germany and Nicaragua, the School for International Training, researchers from Alaska, university students). 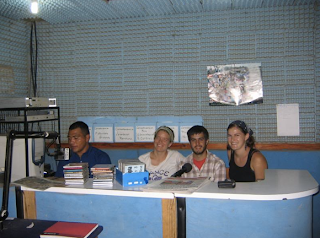 - we have been interviewed on many national radios and some TV and been called for interviews on international radios in USA, Canada, Argentina, Mexico and some in Europe!! - we received a workshop on Informative Technology Security, how to keep our computers and networks safer also from UDEFEGUA. - we received another workshop from UNDEFEGUA on Mental Health and Political Violence. - we received an anonymous grant to help with security issues in Cabañas. - we helped to plan and carry out a "Solidarity with the People of Cabañas and No to Metallic Mining" event in the park of Victoria during the Mons. Romero Anniversary Week in March with many national and international delegations, over a thousand people attended. - we received a small grant from Journalist Helping Journalists in Munich, Germany - we applied for and were granted a one year scholarship from the Hamburger Stiftung Foundation for Isabel Gamez to live one year in Hamburg, Germany with her 9 year old son. It is a grant for her to rest and recuperate, she can study or work with organizations if she wants but can also just take time for herself, all expenses paid. - we are participating in a project directed towards women, youth and alternative communications media in Cabañas, which includes improving the Radio's infrastructure, expanding our broadcasting coverage, re-establishing and re-enforcing skills for our Community Correspondent Network and Community Radio-Listeners Groups, audience surveys and training for the entire Radio team in terms of learning to put into practice the focus areas we have defined (Human Rights, Gender Equality, the Environment, Cultural Identity and Participation). - we met with the Organization of American States' Freedom of Expression Relator who mentioned our case in her 2009 report and participated in a workshop on freedom of expression with her and people throughout Central and South America. So, we are doing well, feeling good. Still feel those shadows, still looking over our shoulders, still have some personal guards and police protection at night and on weekends. Still have people who cannot return home to live. I guess you could say our lives have been marked forever. 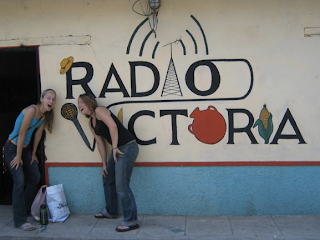 But we are more convinced than ever that Radio Victoria is an important project, that it plays a role in the communities and continues to grow and improve. AND we still have great needs. We were very excited to learn that we would be participating in the project: "Strengthening Popular Organizations and Local Media's Organizational Capacities and Political Incidence for the Exercise of an Equitative Citizens' Participation". This project comes from the Basque Country Government through an organization called Paz y Solidaridad (Peace and Solidarity). So, we need to come up with our contribution to the project, which includes the land we have, the office and building, all the equipment we now have, etc. BUT we also have to pay for all the unskilled labor for putting the wall around our property, building a cistern and clean-up area with 2 more bathrooms and the tower to expand our broadcast coverage. This is around $20,000.00 !!! oh, bejeebers!! so we have around $4,000.00 we can put to that, and our NGO, ADES is trying to come up with a part, but we need to do a campaign to raise money, once again. I mean we are always on a shoestring and fortunately people believe in us and some few send us donations every year, others come and visit and leave a collaboration, we sell t-shirts to others and we are working on a fund-raising plan. Well, one of my tasks in that fund-raising plan is to write this letter with this very petition. We need: - 15 people to give a thousand dollars, or - a thousand people to give $15.00, or - something in between !! !